Dandruff is one of the most annoying hair problem that causes itchiness along with excessive formation of dry skin flakes on the scalp. These dandruff flakes can get trapped in hair and accumulate with oil and dirt. Dandruff usually appears when the skin on the scalp sheds its dead cells, at more quick rate than Normal. 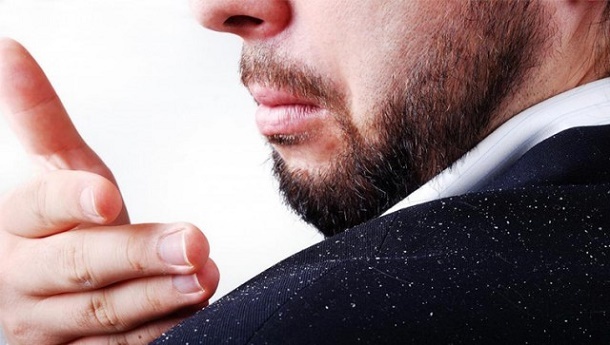 Dandruff in form of white flakes may fall on your face and shoulders and causes a lot of embarrassment. A mixture of coconut oil and lemon juice is highly beneficial in getting rid of dandruff. Take some Coconut oil and mix half the amount of lemon juice in it. Apply this mixture on your scalp. Massage for few minutes and then wash off after half an hour. For best results, repeat this twice a week. Prepare a mixture of one part of sandalwood oil and three parts of fresh lemon juice. Mix them well in a glass bottle. Apply on your scalp half an hour before washing your hair.For best results apply this mixture at least three times a week. Make a mixture of fresh juice of Gooseberries(amla) and pure coconut oil. Boil this mixture till the gooseberries juice is completely absorbed in the oil. Apply this mixture after washing your hair. Massage your scalp with warm gooseberries(amla) oil and wrap a hot wet towel around your head for 30 minutes then wash your hair with good shampoo. Sour Curd mixed with a few drops of fresh lemon juice is also considered very effective to cure dandruff. Apply the mixture on your hair and scalp then wash your hair after 20 minutes . Regular application of few days will show you best results. Mix one part of vinegar with one part of water and wash your scalp with this. Cover your head with a clean towel and leave the vinegar mixture on your scalp overnight. Wash off with clear water in the morning. Prepare a mixture of some honey, lemon juice, and an egg yolk.Mix them well and apply this mixture over your scalp.Massage for some time then Let this stay on your scalp for half an hour then wash off with warm water. Strong antifungal properties of tea tree oil are very helpful in getting rid of dandruff caused due to fungal attack. Add a few drops of tea tree oil to your regular shampoo before washing your hair. Add one drop of this essential oil per ounce of shampoo. Alternatively you can mix a few drops of tea tree oil with a tablespoon of olive oil or coconut oil. Apply it on your hair and massage your scalp for few minutes. Let it stay at least for one hour and then wash off. For best results, repeat this twice a week. Mix 1 teaspoon of olive oil in 1 teaspoon of lemon or lime juice. Mix them well and apply to the hair and scalp then cover with wet towel and leave it overnight. Early morning Rinse off with warm water then wash with normal shampoo. Add 2 tablespoons of fenugreek seeds to a bowl of water and soak overnight. Next morning mash them to form a paste. Then apply to the scalp and leave for half an hour. Then wash out with normal shampoo. Beetroot juice is also considered good to cure dandruff. Grate raw beetroot(Chuqandar), squeeze it juice, mix it with a little vinegar and massage the scalp with it using your finger tips. Wash it off after 20 minutes with a mild shampoo. Neem is also considered very effective to cure dandruff. Soak some neem leaves in water overnight, filter that water and use it to rinse your hair.